Differentiated supply chains usually depend on different packaging forms. A common distinction is made between the primary packaging which is directly exposed to the product (e.g. paper wrap around candies), secondary packaging which defines the selling unit (e.g. plastic bag containing 25 candies), tertiary packaging (e.g. folded box containing 100 bags) and loading units (e.g. palette containing 20 boxes). The existence of these diverse types of packaging indicates how much packaging material is needed for international multi-stage supply networks of highly processed foods. Specific transport practices for food are connected to certain forms of packaging. The transport requirements for reusable glass bottles differ substantial to the demands of beverage carton or PET-Bottles. However, it is not only the complexity and dispersion of supply chains which forces the increasing need for packaging but also complex space-time trajectories of individual consumer routines. The coordination of day-to-day operations within households and families is not only supported by modes of mobility but also by packaging which allows flexible transportation of consumer goods. Prominent examples of this demand for spatial flexibility are recent trends like food to go – most visibly in the flooding of cities with single-use coffee cups. Summing up, transport occurs at multiple stages in supply chains. Examples include transport of raw materials from farm to factory or the transport of final products from manufactory to the retailer. All of these transport practices entail different engagements with packaging. To provide a descriptive example of connections between packaging and transportation, I will now shift attention to the final stage of this transportation chain through the carrying of purchases from supermarkets to private homes. In his illustrating article Hagberg (2016) presents the history of grocery bags as a coevolution between material properties of the bags and diverse practices they are engaging in. His narrative starts with the introduction of bags into shopping practice, connected to the emergence of self-service, and continues through the practices of carrying, transporting, advertising, disposing and selling. Overtime bags have changed from a form of packaging for goods into a container for already-packaged goods. In carrying, they were transformed through the attachment of handles, the strengthening of materials to bear more weight, and new materials such as plastic, which could protect against rain. The material adaptation of bags can be connected with the transformation of travel modes. The material adaptation of bags can be connected with the transformation of travel modes. : While it was common in the 60s to walk to the store, the expansion of other forms of mobility namely cars changed the requirements for grocery bags. 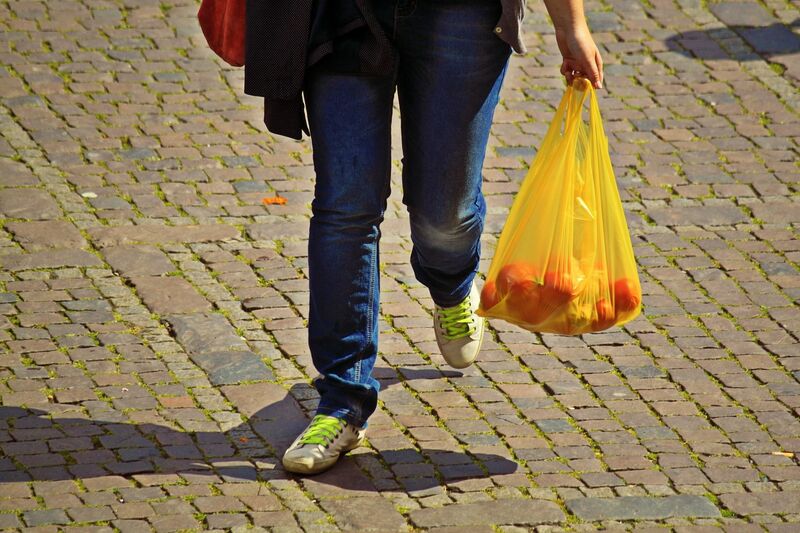 Important influences which are related to practices of transporting grocery purchases can also be found in the role of advertising on shopping bags, the increasing flexibility and spontaneity of shopping. Overall, the example shows how the multidimensional use of shopping bags make it hard to disclaim them. While they are easily exchangeable in single practices, it is there inclusion in multiple types of practices which make them imperishable. The example of shopping bags shows how practices of spatial mobility are crucial for the transformation of packaging technologies. More importantly, the transportation of objects and people takes time – geographical matters of “food miles” are deeply connected to questions of durability, storage time, pace, spontaneity and flexibility. Next week I will go deeper into these temporal aspects of packaging. Hagberg, Johan (2016): Agencing practices. A historical exploration of shopping bags. In: Consumption Markets & Culture 19, 1, 111–132.